What is the LPS 1175 Certification? The LPS 1175 specification analyses the burglary resistance of doors and building components by testing and clarifying them to established standards. This is done by assigning products with grades between 1-6. The LPS 1175 standards were founded by the LPCB - the Loss Prevention Certification Board, an initiative that has worked alongside the government and industry sectors for over a centuary to establish and maintain standards of security. Steel doors tested under these standards provide real security which is measurable by a defined scale. Other security rated steel doorsets are also available under different test standard such as the European RC and WK ratings or PAS 24. Samson can help with all of these and provide certified doors for compliance in most market sectors. We have a number of products that are LPS 1175 certified, including roller shutters, security grilles and steel door sets. If you're looking for high quality products that are designed to protect your property, browse our shop using the buttons towards the bottom of the page, or simply give us a call! The Samson SecurGuard and SecurGuard PLUS offer various levels of security for commercial environments, the latter range providing protection against experienced intruders and even some explosives. Both of the SecurGuard ranges consist of three doors, all of varying levels of security - we can help you differentiate and conclude which is the most appropriate for your premisis. 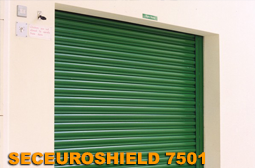 The SeceuroShield 3801 and 7501 are LPS 1175 certified aluminium and steel security shutters respectively. Both also awarded with the Secured by Design accreditation, these security shutters are manufactured to offer real physical security against potential intruders. The SeceuroShield models are ideal for offering security in environments such as offices and retail and have a high quality level of finish in material and colour finish. Generally available as manual or electric operated shutters and all made to measure as standard to optimise in the application. Retractable security grilles are a very effective way of preventing potential burglaries due to their reliable and durable physical security levels, as well as creating a strong visual deterrent. 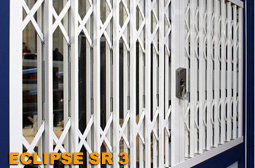 The SeceuroGuard 1001, Vulcan SR2 and Eclipse SR3 grilles all offer levels of security that can be proved via their multiple security accreditations; the Vulcan and Eclipse are the only security grilles certified to protect against bolt cutters. SR2 and SR3 rated grilles and level 1 secured by design are all available across these ranges to suit the application. All the grilles are made to measure and available in almost any powdercoated colour finish with a choice of handles and locking arrangements and positions. Samson Doors are well known for a wide variety of security driven door, shutter and grille products, and the LPS 1175 options are simply a defined set of products for use in higher risk applications and environments. A further explanation of the wide variety of test standards relating to doors, locks, grilles and shutters are all shown below with the LPS1175: Issue 7 being the most relevant standard in the products here. Enhanced security performance requirements for doorsets and windows in the UK. Doorsets and windows intended to offer a level of security suitable for dwellings and other buildings exposed to comparable risk. This PAS supersedes PAS 24:2012 with effect from 28th February 2016 and provides a method for testing and assessing the enhanced security performance requirements of doorsets and windows, providing an easier specification requirement for developments. This PAS covers doorsets and windows of all material types. Products are still required to meet the material specific requirements as detailed by the product standards for doorsets and windows. Requirements and testing procedures for the LPCB approval and listing of building components, strongpoints, security enclosures and free-standing barriers offering resistance to intruders attempting to use stealth to gain entry. LPS 2081 SRB specifies identical tools and times to those specified to LPS 1175 SR2. However, the test is conducted avoiding making excessive noise to replicate a stealth attack common in a residential environment. When LPS 2081 is used as a route to gain SBD approval, SRB is the minimum requirement for a doorset, and SRA is the minimum requirements for a window. Thief resistant locks. Key egress. The minimum standard for locks on external or entrance doors to be acceptable to the Association of British Insurers (ABI) and the police service. The effectiveness of the lock also depends on the quality of the door, frame and other hardware which is not tested by this standard and which may fail before the lock. Thief resistant locks. Keyless egress. As above but accommodating locks that offer egress without the use of a key. As above but with external deadlock override facility NB only to be used on properties with an alternative means of escape. Multipoint locking assemblies. Keyed egress. Performance requirements and test methods. Essentially a multipoint lock equivalent to BS 3621, utilising the same methodology i.e. key operation from both sides. Essentially a multipoint lock equivalent to BS 8621, utilising the same methodology i.e. key operation from the outside with non key operation on the inside (thumb turn or similar). Essentially a multipoint lock equivalent to BS 10621, utilising the same methodology i.e. key operation from the outside with non key operation on the inside but with an additional facility to deadlock the door from the outside using a deliberate secondary positive action. NB such locks must only be used on properties with an alternative means of escape. Based upon BS EN 1303:2005 and the General Vulnerability Assessment from BS 3621 this standard incorporates additional requirements to address critical issues relating to the security provided by cylinders and associated keys. An equivalent test standard to DHF/GGF TS007, published by Warrington Certification. Based on BS EN 1303:2005 and the General Vulnerability Assessment from BS 3621 this standard incorporates additional requirements to address critical issues relating to the security provided by cylinders and associated keys. A performance standard for door sets, which certifies that a particular door set, is fit for purpose. The security rating is not sufficient for police/insurance purposes and products must also have PAS24. NB. This standard is due to be withdrawn and will be replaced by BS 6375 parts 1, 2 & 3. Part 1 single leaf, external door assemblies. An attack test standard for door sets which certifies that a particular door, frame, lock and hardware set has withstood a series of physical tests based on common methods of burglary. This is the minimum police requirement for Secured by Design dwellings. This PAS supersedes the PAS 24:2007+A2:2011 with effect from 31st August 2012 and provides a method for testing and assessing the enhanced security performance requirements of external doorsets and windows providing an easier specification requirement for developments. This PAS covers doorsets and windows of all material types. Products are still required to meet the material specific requirements as detailed by the product standards for doorsets and windows. As the title suggests this is an equivalent test standard to PAS 24, incorporating PAS 23 (fitness for purpose), published by Warrington Certification. This includes doors, shutters and grilles primarily for commercial premises and some door and window applications for higher risk domestic premises; it is acceptable to the ABI and the Police. The standard has 8 levels, 8 being the highest, and levels 1 and 2 equivalent in many respects to PAS 24 for doors. Requirements for burglary resistance of construction products including hinged, pivoted, folding or sliding doorsets, windows, curtain walling, security grilles, garage doors and shutters. This specifies a broadly similar range of attack tools and times to those specified at the lower levels of LPS1175. However, STS202 does not extend to cover the higher levels of risk addressed within LPS1175 and the attack methods used differ. Based on LPS 1175, this standard classifies glazing units that offer resistance to manual attack. Approved products are given a 3-digit rating according to their resistance to creation of local, hand-sized, and full body access apertures. This also allows manufacturers and specifiers to determine which glazing units offer attack-resistance commensurate with the Security Ratings defined in LPS 1175: Issue 7. Requirements and test methods for all forms of door viewer, designed to be used on doors in buildings, to allow occupants to detect and identify callers without having to reveal their own identity, or even their presence in some circumstances, to the caller. This standard specifies requirements and test methods for all forms of door opening restrictor designed to be used on doors in buildings. Enhanced security requirements for letter plate assemblies that allow mail to pass directly through the fabric of the building (door, wall or panel), and slide through boxes that allow mail to pass directly through the fabric of the building (door, wall or panel). This standard covers requirements for lockable letter box assemblies that are free standing or surface mounted and where mail is retrieved from the same side as delivery.